I think there are two major ways to enjoy an issue of Frontier, Youth In Decline's spotlight-showcase anthology. The first and obvious way is for the comics presented. This issue, the first in a loaded 2014, features Sacha Hommer, a German cartoonist in his mid-thirties. He is best known, I think, for Insekt, although he's an active comics maker and illustrator with a significant presence in anthologies (including his own Orang) and on-line. His the kind of talent around which scenes are built, and through connections are made across international boundaries. All three stories presented here are visually compelling, nudging at the boundaries of the expectations for narrative comics in a pleasing way. 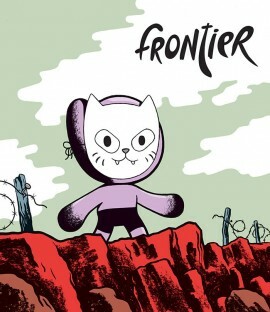 For instance, the kitty mask on the cover and used by the protagonist in "Drifter" is both funny and a telling reflection of that character disdain for the world around them. It is the kind of comic to which one will return two or three times after thinking what you'll get from it will be exhausted. If you see it, buy it. The other avenue for entry into this work is via its nature as a comic book, part of a series three issues in, and what that might mean in a year some 20 years past the date when a comic book like this might have found a half-dozen same-month release partners on the shelves of a comic shop. There's very little bending to commercial exigency here; it's an arts object without an ISBN or even price on the cover. One imagines that its audience will hand-purchase it or will have fashioned a mini-pipeline for this material into their homes via the Internet -- the most personal and most impersonal ways of shopping. The nature of the material makes this the most sampler-seeming issue of the series so far, the kind that you use as a springboard for a future purchase or as a nudge to go check out what work exists; even the interviews ask for more. This might in some way be intentional: the material was culled from different sources spread across three year. For someone whose publishing identity seems driven by the reputation of having good taste, I don't know much about Sands yet, where he might distinguish himself as something more than someone that publishes from a list of agreed-upon cool people. I trust the comics published through Frontier more than the sum of its expression, and that's a curious place to be with an anthology.